A Facebook post by the Future Farmers of America’s local chapter at American Fork High School generated over four hundred reactions, most of them negative. “After nearly 100 years of Agriculture Education at American Fork High School, we are saddened to announce that the school has decided to close down the Agriculture program,” the post read. The Alpine School District has confirmed that the program at American Fork High School would no longer be offered in the 2019-2020 school year. Kimberly Bird, of the District, said the decision was not based on funding but mostly students’ interests, as the school juggles teachers’ full-time equivalencies. Full-time equivalency is a full-time teacher's teaching load against that of a part-time teacher. Enrollment figures provided by the District highlight the students’ drop in interest. Enrollment in the four agricultural classes are currently standing at 11, 21, 22, and 24, while the same instructor's other two classes in greenhouse and horticultural were at 30 or higher. Teachers in the Agricultural program don’t tend to stay, Ms. Bird said. The FFA instructor has decided to transfer to another school, making it the fourth teacher to do so in the past five years. While it’s unclear why fewer students are interested in the program, it could be the latest sign of changes in American Fork and its transformation from a farming and ranching community, as its youth is now more technology-centric than ever. Ms. Bird said class enrollment is growing in subjects like computer sciences, medical terminology, anatomy and forensic science. The District said that starting next year, American Fork students can take agricultural classes at nearby schools such as Lehi, Skyridge and Westlake high schools. Still, in reply to the FFA Facebook post, there are over 100 comments written by American Fork parents and grand-parents who said they had benefited from the program. They credit the program for teaching more than just a way to learn about agriculture. Some, including Brady Coats, who is a current student, say the skills learned can’t be found anywhere else. American Fork beat Pleasant Grove Saturday in the last game of the season crowning the Cavemen 6A State Champions, a feat not realized since 1979. The red-and-blacks had qualified for the finals after beating Davis in a heart-stopper triple-overtime game Friday that was decided in the last 1.2 seconds, when American Fork senior forward Tanner Cuff converted on a tough layup, breaking the 80-80 tie. In that game, four of American Fork’s starters were on the bench, fouled out, by the second overtime. The game was played on March 1st, and so March Madness began. Now, with a head coach who was teaching at American Fork High School for the first time this year and a team that didn’t even qualify for the State tournament field in each of the last two seasons, the Cavemen entered the final game against a rival who was in the State championship for the second year in a row, Pleasant Grove. In mid-January the Citizen highlighted Ryan Cuff as a first-year coach to watch, when the Cavemen were undefeated at 14-0. Flashbacks from the triple-overtime game quickly appeared when American Fork trailed Pleasant Grove after the first quarter, 16-18. But it was the last quarter they would give up to the white-and-blue Vikings. The Cavemen would edge the Vikings by half-time, 31-27, and emerge victors, State Champions, with a score of 66-57. The game featured Isaac Johnson, a 7-foot senior bound for a Pac-12 school next year (Oregon). While the road on 200 South, which runs south of I-15, doesn't seem at first glance like a main artery of American Fork, it is one of the most frequented roads by residents and commuters to access the train station. Its widening and redesign — from 300 West to Mill Pond Road — will likely become American Fork's biggest road project this year when construction will launch as early as fall. The City held an Open House at the Historic City Hall Wednesday evening where plans were on display on two tables. City Administrator David Bunker, as well as team members assigned to the project, were available for questions. 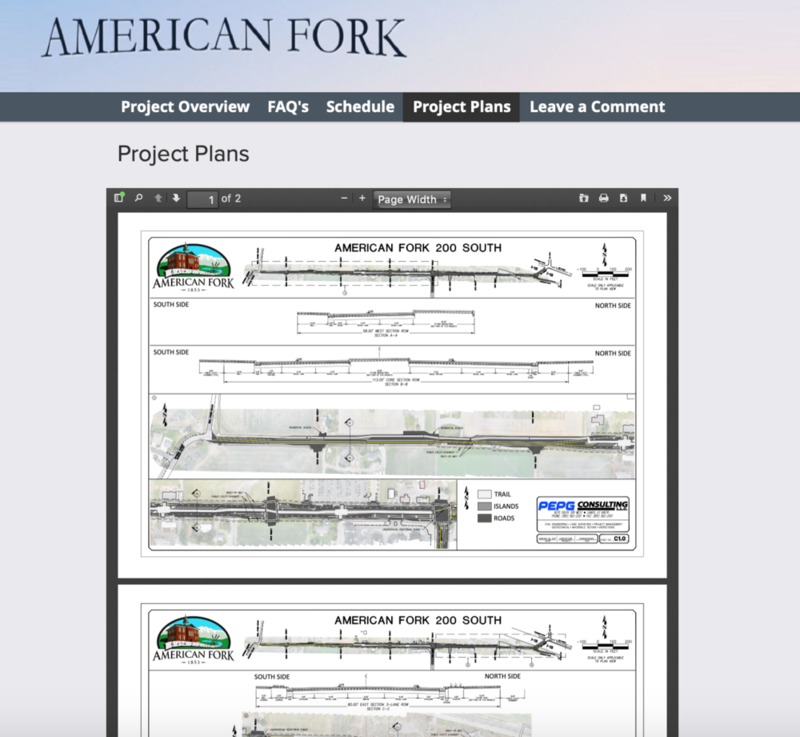 The City on Wednesday also made the design concepts downloadable from the project's dedicated website, af200south.com. The City said the project is necessary because it sees an opportunity to develop the area and steer development in the direction that fits with the City's vision. The plans call for the road to go from two lanes to five. Adding trail and bike lanes will make the road safer for use, the City said. “Currently 200 South does not provide a sidewalk or trail allowing a safe transportation route for pedestrian and bicycle access to the FrontRunner Station,” the City said. In the City’s bigger picture of a Transit-Oriented Development, it wants residents to be able to connect from the Murdock Canal Trail to the FrontRunner Station. And if funds are available, the project can also improve intersection crossings on two major corridors for those seeking to get to the FrontRunner Station in American Fork. The designs should be finalized in the summer of 2019 with construction possible as early as fall. 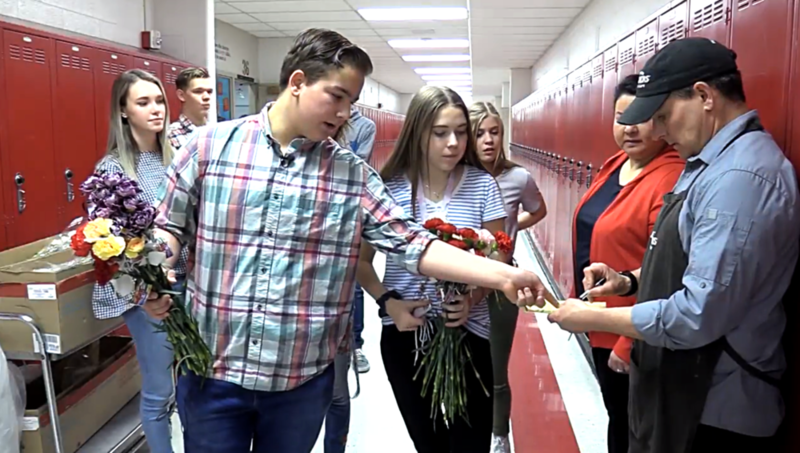 A student who saved money from summer jobs bought flowers for all the girls at American Fork High School. With help from his parents and a few friends, the flowers were delivered throughout the school on Valentine's Day. The student, Ryan Bezell, earned all the money himself to buy the 1,200 long-stem carnations. This is the third time Ryan, a Sophomore, made sure all the girls at his school were smiling on Valentine’s Day. Ryan said it was an English teacher in Eighth Grade who had taught about marigolds and walnut trees that inspired him to do that. 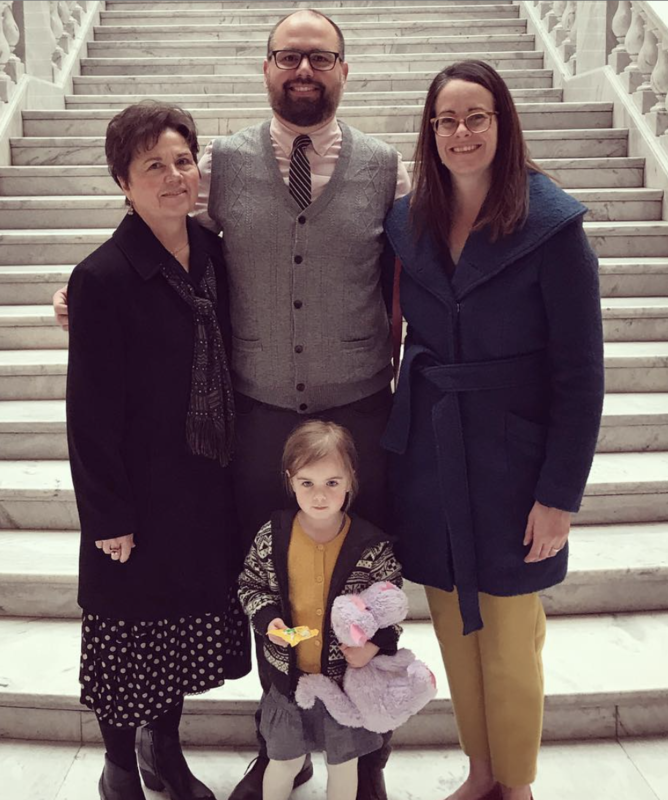 American Fork City Councilmember Staci Carroll said she wishes for more people like Ryan, people who do good, not because of an assignment, but because they simply chose to. That some of the scenes of the 1984 hit movie “Footloose” featuring Kevin Bacon were filmed in American Fork is no secret to long-time residents. So the Citizen deemed a musical of the same name, which debuted Friday by the American Fork Community Theater at the Dan Valentine Auditorium, worth a detour—and a review. Actor Paul McNiven who plays the lead character Ren McCormack—whose mission to liberate his fellow teenagers by convincing the local reverend to permit a dance—exhibits energizing vocals which are matched by his precise dance moves. He adeptly plays up comedic moments, such as badly roller-skating at his after-school job. The romantic lead Ariel is played to great effect by Cambry Wallentine, who rises wonderfully to challenging music. Her best moments are expressed in family dynamics with her reverend father and her pacifying mother, responding intelligently to various groups of peers and elders alike and her relationship with Ren seems to grow naturally from that. Another budding romance onstage is hilariously and sweetly stumbled through by the leads’ best friends. Willard (Derrick Cain), a mama’s boy with few social skills, is the most delightful cast member to watch because of his personal journey from “aw-shucks” goofball to dancing dynamo. Rusty—the girl he’s been awkwardly interested in since kindergarten—is the wonderfully brash and belting Shannara Jones who exudes confidence, dances with abandon and always has a snappy comeback. Jones’ homage to her crush, “Let’s Hear It for the Boy,” is an absolute showstopper in which she sees the best in a simple young man who is concurrently learning to be the dancer of her dreams. Because the ensemble is burdened by community guilt and fear for most of the play, the transitions in the society are wonderful. The teenagers are realistically celebrating individuality and the leaders are very relatable with their cautious approach to doing no harm. No matter the level of experience, there are many cast members to watch in the future. The choreography by DaMelly Alderate is impressively challenging but reminiscent of the story’s era and mastered by the entire cast. The costuming by Katrina DeKarver stands out at several moments throughout the show as well as the all-important formal wear unveiling. Although it is a story that can be appreciated when it understood, it is best suited for more mature audiences due to the mentions of sexuality, drug use and domestic violence. 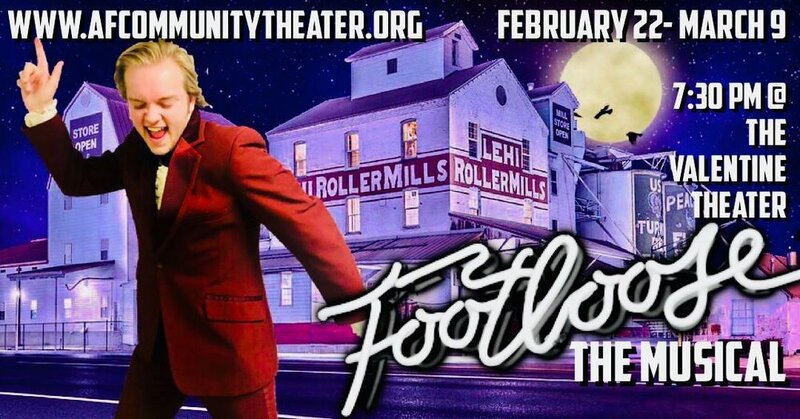 American Fork Community Theater’s Footloose is energizing and empowering and runs until March 9, so you have plenty of time to kick off your Sunday shoes and cut loose. American Fork Community Theater Presents Footloose by Dean Pitchford, Walter Bobbie and Tom Snow. Dan Valentine Auditorium, 839 E 900 N, American Fork. Feb. 22-Mar. 9, 2019 7:30 PM. Tickets are $10 and can be purchased here. Most American Fork High School seniors who will be attending Brigham Young University in the fall of 2019 have received their letters of acceptance by now. AMERICAN FORK HIGH SCHOOL WIDE RECEIVER DEVIN DOWNING. But Devin Downing, the six-foot-two, 175-pound Caveman wide receiver, is a year ahead of everyone else. Though he is just a junior, he received an offer Wednesday to attend BYU in 2020. Devin told the Citizen he plans on serving an LDS mission when he graduates from American Fork High School, so he wouldn’t be playing for BYU until 2022. Still, playing college football has always been a dream of his. The Citizen was first to report last month that his teammate, quarterback Boone Abbott, would commit to the University of Hawaii. If Devin accepts the offer, he will join another Caveman wide receiver at BYU, Chase Roberts. Chase was the top receiver in Class 6A, ranking in the top-eight in Utah history for receiving yards in a single season. Devin and Chase are among the closest of friends on and off the field and have fed off each other’s success. During the overtime victory game against Bingham that qualified American Fork for the State championship last November, Devin had 11 catches for 162 yards. On the final offensive play in overtime, he snagged a perfectly thrown back-shoulder fade pass with his left arm in the end zone, giving the Cavemen the lead for good. And did we mention he is just a junior? New mothers who are breastfeeding may produce more milk than their child can consume. And while many mothers pump excess milk and store it for future use, some find they never use the surplus. For the first time at American Fork Hospital, local mothers can go to the hospital to donate the milk instead of throwing it away. The 83-year-old hospital, which now counts over 200 physicians representing 30 specialties, said starting Tuesday it will work with Denver-based Mountain West Mothers Milk Bank, a non-profit organization established in 2014, for screening, processing, storing and distributing the breast milk. After a mother is screened, all milk collected at the American Fork Hospital is packaged and sent to the milk bank in Denver where it is pasteurized and tested to ensure it is safe for babies who need it. The milk is then sent to more than 120 different hospitals in 24 states. While banking breast milk has been around since 1910, hospitals in Utah have been using donated milk in NICUs since the early 2000s. Mothers’ own milk is always preferred but the next best option is pasteurized donor human milk. Women that would like to donate milk must complete a telephone prescreening and blood test before their milk can be pasteurized and distributed for use. Donors must be non-smokers with no history of drug abuse, alcohol abuse or other risky behavior. To be prescreened over the phone, call the milk bank in Denver at 303-869-1888 or toll free at 877-458-5503. American Fork Police said this week an anonymous donor bought a protective vest for one of the department's K9s by making an unsolicited donation of $950. The K9 body armor, which is bullet and stab proof, will be given to Zeke, one of the two American Fork police dogs. The vest will be provided by a non-profit organization called Vested Interest in K9s to whom the donation was made. Zeke’s vest will weigh “four to five pounds,” according to the brochure, and arrive in eight weeks. It will be embroidered with the words “Honoring those who served and sacrificed,” a sentiment chosen by the anonymous donor, a likely resident of American Fork. The donation is the latest example of American Fork residents’ support for their police department, a department with a yearly budget of $4 million. The two K9s were purchased through thousands of dollars' worth of donations. And though dogs wear no commercial endorsements, their purchases and training costs were also supported by local businesses. Bank of American Fork, for example, donated $11,000 toward the K9 program in 2014, a contribution the bank never publicized. The American Fork Police Department said it is grateful for their K9s, and citizens should look at those dogs as theirs. But it's not just four-legged officers that are getting attention of good-hearted citizens. Last year, the department received a private donation that allowed the purchase of active shooter kits for all of its officers. The kit included ballistic plates and helmets, saving American Fork City over $15,000. From cashier to retail associate to supervisor, half a dozen jobs are still unfilled at Burlington’s newest location. Burlington Stores—formerly known as Burlington Coat Factory—is coming to American Fork at the Meadows, on 268 North 750 West. The store will be 32,800 square feet in size and is expected to open in March. The New Jersey-headquartered store retailer, named after the city in which it was started, is almost half a century old. 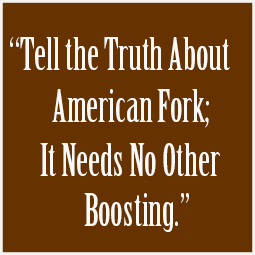 American Fork’s location will be its 8th in Utah. Burlington Stores, which has stores in 45 states and is publicly traded on the NYSE, is the latest nationwide retailer to come to American Fork, helping boost sales tax revenues for the City’s coffers. American Fork sales tax revenues, which have never been higher, are estimated to reach $9 million in 2019. It is now the largest revenue source for the City and is anticipated to grow by 5%. An artist from American Fork has been commissioned to create a sculpture for the National Statuary Hall, a chamber in the U.S. Capitol devoted to sculptures of prominent Americans. NATIONAL STATUARY HALL, WASHINGTON, DC. The statue will be of Martha Hughes Cannon, the nation’s first female State senator, who is from Utah. The American Fork sculptor, Ben Hammond, has been the recipient of numerous awards including the Gloria Medal, the Beverly Hoyt Robertson Memorial Award, the Charlotte Geffken prize, the Dexter Jones Award. His sculpture “An Angel In Contemplation” won first place at the Portrait Society’s International Show last year. The Statuary Hall, where his sculpture of Utah Senator Martha Cannon will be displayed, is one of the most visited rooms in the U.S. Capitol and continues to be used for ceremonial occasions, including activities honoring foreign dignitaries. The newly elected President is hosted by Congress in the Statuary Hall every four years for a luncheon. Martha Cannon, born in 1857, worked as a physician and fought for women's rights. She helped put women enfranchisement into Utah's constitution when it was granted statehood in 1896. A polygamous wife, she became the first female State Senator elected in the U.S., defeating her own husband, who was also on the ballot. Utah’s 25 female lawmakers gathered at the State Capitol on Thursday to celebrate the announcement, exactly 149 years after the first female cast a vote in the U.S.
“I’ll do my darndest to do a great job for this truly amazing woman and for our State,” he said. For the first time in three years, gasoline prices have dipped below $2 a gallon in American Fork. Just in time for Valentine's Day and Presidents’ Day weekend, the price of regular is at $1.95, a welcome break for residents in the middle of tax season. The last time it averaged that low here was in April of 2016. Gas prices at most stations in Alpine, Cedar Hills, Orem and Provo are still above $2 a gallon. The cheapest gas in Salt Lake City is $2.03 a gallon; in St. George, $2.39, according to GasBuddy.com, a website that tracks gas prices across the nation. Lehi and Pleasant Grove are joining American Fork with sub-$2 prices for the gallon of regular. Tooele currently has one of the cheapest gas in Utah, at $1.82. When I texted Allie Hill Monday afternoon to set a time for an interview, she happened to be in the pool. I should have known. Allie trains nine times a week, and though she broke two State records in her category this weekend, helping crown the Cavemen State Champions, she is already back in the pool Monday. While high school athletics are often saturated with football, baseball and basketball, it's difficult to overstate how physically demanding swimming is, a sport where two thirds of the body's muscles are worked. The swimmer's lower and upper body, arms and legs, trunk and head are all forced to make a balanced effort—in a horizontal position. And then, there's the small matter of jumping in a body of water every morning before school when it is still cold and dark outside. That takes a certain level of mental toughness that not all teenagers are necessarily equipped with. American Fork High School student Allie Hill, who has been swimming competitively since the age of 7, was barely a freshman last year when she broke the state record in 500-yard Freestyle. That record was broken by three seconds at the BYU meet this weekend—by her. American Fork head coach Kathy King told me Allie possesses certain traits that are common among the best, like understanding the importance of deliberate and meaningful rehearsal of what she wants to replicate in her races. “Allie is reliable, trustworthy, dependable. Allie is one of those swimmers that you can always rely on,” Ms. King said. In addition to Allie's victory in the 500 Freestyle Saturday, she posted an impressive performance in the 200 Freestyle: the sophomore’s time of 1:57.09 was the only swimmer in the field under the two-minute marker, setting a new Class 6A record. The American Fork girls team finished with 376 points to win the crown, with Lone Peak coming in second and Syracuse finishing third. Still, when I asked Allie what she loved most about swimming, there was no mention of winning a competition or making a good time. There was no mention of medals or trophies or the quiet assurance that comes with being the best at something. It was all about the people. While Allie's generation is often criticized for spending too much time indoor on their screens, Allie defies the stereotype. She snow-skis, she water-skis, she likes to go camping. And she'd recommend swimming as a sport because “it gives kids something to do in the summer instead of sitting at home bored,” she said. Still, for Allie, swimming is not just about interacting with water, but the people. Meeting people from different cities and swimming with them is an enriching experience. The Alpine School District is finding ways to improve how it communicates with parents and employees after it found itself in the crosshairs last week, when it decided to remain open during a snow event that created hundreds of car accidents in Utah. The recent events have highlighted the challenges of managing the largest school district of a mountainous state—the 43rd largest district in the U.S. out of 17,000—when weather conditions change and decisions have to be communicated to over 70,000 students and employees by a deadline. The District, which is headquartered in American Fork, sends a team of “spotters” at night to monitor the weather and road conditions at all district’s schools. The spotters, who come from different departments and include plow crews, school custodians and the administrative cabinet, report to the Superintendent as early as 5am. The Superintendent will confer with other Utah County school districts at 5:15. A final decision is made by 6am. In a new move this week, the District shared videos of the road conditions near the schools. “We thought capturing video and photos from our spotter areas would hopefully improve the public's confidence in what we say we were seeing and what people actually saw,” Ms. Bird said. When the storm hit Wednesday and continued to intensify after the decision to stay open was made, over 700 “angry-face” emojis were used by parents and employees as replies to the District's Facebook post. The post indicating the schools would stay open had been written at 5:30am, “a little earlier than normal,” Ms. Bird said. “AlpineDistrictSnowDay,” an Instagram account posting memes lamenting the District's decision to stay open, was created Wednesday morning and attracted over 6,000 followers in just 24 hours. An article on Buzzfeed profiling the Instagram account put a nationwide spotlight on the District. Keeping up with social media almost became impossible, the District said, and it decided to communicate with the public through traditional media, giving interviews with four TV channels and two newspapers. The timing of yesterday's storm made the decisions easier than last week's. “Had last week’s storm occurred during the same time frame as last night’s storm, our response and communication on social media would have looked more engaged,” Ms. Bird said. Last week's public feedback has not gone on deaf ears, the District said. The feedback provided some of the improvements in communication, including alerting the parents the night before that the weather situation would be monitored and providing the road pictures and videos by spotters. Technology Drive in American Fork will be changed to its old name, highlighting the complexity of city growth management and street naming, as more businesses are moving to American Fork and a city government tries to be accommodating. Technology Drive, a street portion of Auto Mall Drive, from the corner of 620 South to 500 East, is switching back to Auto Mall Drive after some business owners protested the change, in a rare back-and-forth among businesses while the City found itself in the middle. Tyler Powell, the general manager of Utah Carriage House Doors, one of the largest manufacturers of wood garage doors in Utah, said his company moved to American Fork in May and purchased over $15,000 in brochures with the Auto Mall Drive address before the street name was changed to Technology Drive. “A business like mine, I can't afford to change that address on all brochures,” he said. Utah Carriage House Doors is one of several companies that has moved to Auto Mall Drive, a street south of the freeway mostly known for its car dealerships. As the street expanded, it became the home of many new businesses, few of whom having anything to do with cars. Ability Diagnostics, for example, a medical lab that receives tissue samples from hundreds of physicians in the U.S., said that it contracts with shipping companies for prompt delivery. Replacing the thousands of prepaid shipping kits already in doctors' possession would be costly—not to mention the consequences of a delayed sample because of address confusion. Dealing with insurance reimbursement when an address has changed can be problematic, too, according to Brooks Anderson, Ability Diagnostics’ president, who believes the new street name can cost his company upward of $800,000. Based on businesses’ feedback, American Fork has agreed to reverse the change. After just a few months of existence, Technology Drive will again be Auto Mall Drive. Still, the City says the back-and-forth could have been avoided, and a lack of communication is to blame. The change to Technology Drive was prompted last fall, when HK Composites, a business with clients in several countries, asked American Fork to change the name of a portion of Auto Mall Drive, leaving the street where dealerships are located untouched. American Fork City agreed to the change after strict requirements were met, including receiving documentation that the business owners along that portion of Auto Mall Drive agreed also. The City published in the paper for two weeks a notice to accept any public comments regarding naming the street Technology Drive. But none came. For City Councilman Rob Shelton, it wasn’t the first time that residents had come to him feeling blindsided by a change though the City had tried to broadcast the information ahead of time. The president of Ability Diagnostics, at the end, said he came away impressed by American Fork City for listening to feedback and being willing to revisit the matter. “That speaks volume about [the] minds in the council,” Mr. Anderson said. While American Fork received its share of snow Wednesday, an American Fork resident and his son saw the end of an ordeal that could have had a much less positive ending. The Gallatin County Sheriff’s Office in Montana said a call came Tuesday at 6:30pm from a concerned wife in American Fork reporting that her husband and 12-year-old son were overdue from a hiking trip in the Spanish Peaks area, the mountain range in southwestern Montana between Bozeman and Ennis. The boy, who had gotten separated from his dad during the hike and then became disoriented, was found at 10pm by volunteers of a Search and Rescue team. No fewer than 20 snowmobilers and skiers had decided to help in temperatures below zero when called upon by the Sheriff’s Office. The boy was hypothermic and confused and was taken to an ambulance. At 12:15 Wednesday morning, rescuers on skis located the father near the Pioneer Falls Trail. He was conscious but hypothermic. After they carried him using a rescue toboggan, he was transferred to a snowmobile rescue sled and finally to an ambulance. Both the father and son were flown to the University of Utah Burn Center where they received treatments for frost bite injuries. Their identities were not released. The Family History Center located in the Alpine Tabernacle is holding an open house this weekend and everyone is invited. The Family History Center, which has been under renovation for 18 months, is inviting the community to visit the Center's new features, including five giant discovery monitors, as well as a story recording room. Though Family History Centers are run by members of The Church of Jesus Christ of Latter-day Saints, they are open to the public. The open house will be held Feb. 8 from 4pm to 8pm and Feb. 9 from 10am to 2pm in the basement of the Alpine Tabernacle. The renovations, which were conducted in conjunction with the renovations of the historic Alpine Tabernacle, began in July 2017 and were financed by FamilySearch, the genealogy organization operated by the LDS Church. The Family History Center had a “soft” opening on Jan. 7, when it started training its 90 consultants volunteering at the Center. At any given shift, there are six to eight consultants ready to help patrons. The upgrades are both cosmetic and practical. While the walls of the Center are decorated with historical photos, the 24 desktop computers are now equipped with dual screens, making research a better experience. The story room, which looks like a recording studio, allows patrons to video-tape their personal history for future generations. The new scanners can be used for films, photographs and slides. The five giant screens on the wall are called discovery screens. One of their purposes is to learn about the news events of the patron's birth year, or during the life of the patron’s ancestors. While the world map shows the paths taken by ancestors, another discovery feature indicates if the patrons has had any famous relatives. Ms. Carter, the Center’s director, said that in the future, the Family History Center plans to hold family history classes for the community. The renovations were headed by Ms. Carter, as well as FamilySearch's project manager Arthur Nettleship and the Alpine Tabernacle facility manager, Brandon Mortensen. On average 300 to 600 patrons a month have used the facility, as figures vary through the year. Ms. Carter, an American Fork resident, said that volunteering at the Family History Center has been a rewarding experience. “As people on computers are researching for ancestors, all of the sudden someone will shout, ‘I found him! I've been looking for years! I found him!’” Ms. Carter said. 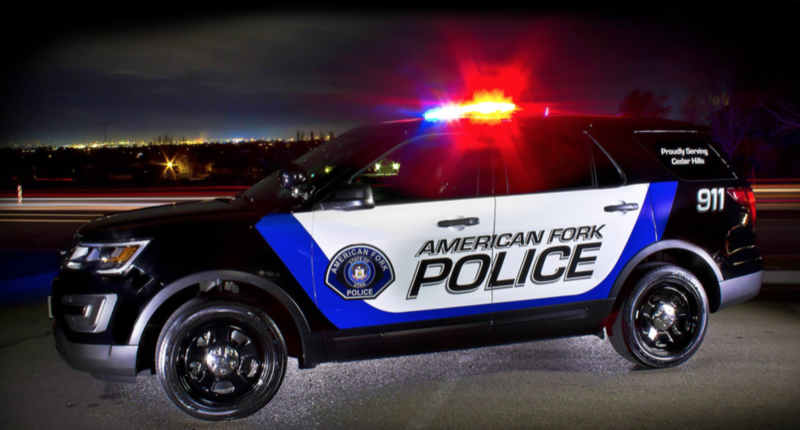 An American Fork man was arrested Saturday after he allegedly assaulted two women who were in the apartment with him, kicking one in the stomach and head and punching the other one in the face, according to a probable cause statement filed by American Fork police. The 31-year-old man was booked into jail. When the police officers' day ended, however, Dawna Whiting's began. “I am on call all the time,” Ms. Whiting said. Ms. Whiting, who is in charge of the Victim's Assistance Program at the American Fork Police Department, gives crisis support to all victims of violent crime. “Actually, it's all crime,” Ms. Whiting corrected herself, as she introduced the program during her semi-annual report to the City Tuesday. “Whether or not it's violent.” It now includes support to victims of fraud and identity theft. Ms. Whiting and two volunteers monitor police reports and call victims to find out the best way to assist them. One of the victims Saturday suffered a broken nose, a broken tooth and fractures in her face and back, according to the police report. The victim can apply for financial help for therapy and abuse-related medical bills. Ms. Whiting will also be a liaison between the victim, investigators and prosecutors, and she will assist if a Protective Order is necessary. Sometimes she has incurred the wrath of perpetrators because she is helping their victims. “Laying low as I can be is best,” she said. The Citizen made the editorial decision to not publish a portrait of Ms. Whiting. American Fork City attorney Tim Merrill said Ms. Whiting is the “best victim advocate in the State.” As she marks this year 10 years in the Victim’s Assistance Program, she is constantly contacted by other city entities as a consultant, according to Sgt. Josh Christensen of A.F. Police Department. Ms. Whiting provides referrals, educates victims about abuse and helps them develop safety plans. Still, a few will never leave their offenders. “I've had a few heartbreaking cases of domestic violence where the mother and children want to leave and simply can't for various reasons,” Ms. Whiting said. Ms. Whiting's office has helped 412 victims in the past six months, including survivors of homicide, victims of domestic violence, sexual abuse, assault, burglary and identity theft. That's on average two victims a day if she worked every single day. Each victim usually requires multiple contacts, as Ms. Whiting also monitors the perpetrator’s court appearances and keeps the victims informed. Her goal is to make sure the victims are safe, the batterer is held accountable and overall recidivism drops in the city. “I've never anticipated running for office and having someone come to me and say, ‘Where do I turn because of this?’” Mr. Shelton told Ms. Whiting. “And you're a great resource to turn those victims over to and give them an outlet they couldn’t have otherwise,” he said. Ms. Whiting can be reached at 801-763-3020 Ext. 250. A soldier who returned from deployment surprised her younger sister at the American Fork Junior High. McKayla Schiro, whose parents are lifelong residents of American Fork, returned Thursday from a nine-month deployment overseas. As a Specialist for the Army National Guard in the 65th Field Artillery Brigade, Ms. Schiro had been stationed in the Middle East, spending most of her time in the United Arab Emirates. The 21-year-old American Fork-native was also in Qatar, Jordan and Kuwait, providing Human Resources support to soldiers and keeping them combat-ready. She came home Thursday and surprised her sister, who was attending dance class at the junior high. Members of the Police and Fire/Rescue Departments, as well as Mayor Brad Frost, met the soldier and her family at the school. Two fire trucks and multiple police cars escorted the family home. When Spc. Schiro entered the dance class in Army fatigues, her sister was facing away. It only took a few seconds for her to recognize who it was, and she rushed to greet the soldier. The company that owns Bank of American Fork reported this week its latest financial results, which include results for the full year, giving us a glimpse into the health of the largest business by asset in American Fork. American Fork-based People's Intermountain Bank said Monday that it capped 2018 with a profit of $40.6 million for the year, more than double the profit it made in 2017. But in 2017, profits were lower than usual because of the costs related to the acquisition of other banks, according to financial statements. The latest financial figures from People's Intermountain Bank, a company created when Bank of American Fork merged with Logan-based Lewinston State Bank in 2013, highlight how strong the community bank headquartered on Main Street, American Fork, for over 100 years has become. As Bank of American Fork marks its 106th birthday next week, it has much to celebrate: the holding company created five years ago by the bank’s CEO, Richard T. Beard, has turned into the second largest Utah-based bank and the largest community-bank holding company in the state of Utah based on asset size, deposits and loans—all the while, remaining profitable. Yes, there is a company on Main Street, American Fork, that reported this week a staggering $2.2 billion in assets. According to U.S. News, 80% of New Year’s resolutions fail by the second week of February. The American Fork Fitness Center said it had experienced a drop of almost 3,000 membership admittances from January to February 2018. “We definitely try to encourage people to keep going and make their goals stick,” Derric Rykert, American Fork City Fitness and Recreation Director, said Wednesday. Still, the Fitness Center continues to be extremely popular the rest of the year and, Mr. Rykert suggested, that could soon become an issue. “We think we are close to capacity on what the facility can serve,” he said. In July 1991, when the idea for a recreation center was first proposed to American Fork residents, the measure failed with only 17% of local voters participating. Today, it's hard to imagine 83% of residents not having an opinion. Almost three weeks ago, over 2,000 people visited the Fitness Center during its yearly fair and took advantage of the one-day free access to the facility and swimming, as dozens of vendors gave away samples and free exams. Yearly pass purchases are discounted that day, and Mr. Rykert said he has sold more passes this year than in 2018. The Fitness Center, which is open 17 hours a day, has recorded over 300,000 membership admittances in 2018. Ten years ago, that figure stood at 245,000. By any measure, it has been a success story. “I've had conversations with other leaders in other cities that don't have that type of facilities, and they're very envious,” American Fork City Councilman Rob Shelton said. The City agreed in December to hire a consulting firm to evaluate the facility, services and programs offered at the Fitness Center. The firm would also look at future growth, fitness trends and provide the City some options for the future. The results will be out by March. “We could expand, we could remodel, we could add a satellite location south of the freeway,” Mr. Rykert said. The population of American Fork was at 19,120 in 1993, when the Fitness Center first opened its doors. It’s over 29,000 today. All the news. Once a week.